So I was reteaching the "pics in ed" class at tech camp today and had a request for some help for teachers who wanted to use Goodreads. Goodreads. I've been on it since 2008. I like it. I know Shelfari has a more visual approach ... but it's kind of like the difference between Facebook and Google Plus. You build up your familiarity and community in one and it's hard to make the move to the other. I just went back and changed it to say Ms. O instead of my first name (Note to self: and maybe I should have thought that through because it changed the URL of my profile page--oops! Have I linked that to anywhere important?). Sign up is pretty much like anything else. Free. You CAN link it to Facebook (and it's a nice way to find friends) but you don't have to. I do NOT have mine set to post to my FB timeline every time I add a book (either as read or as to read) but that is my preference. Don't mind if other people do unless it's clogging up my newsfeed every ten minutes with gross looking book covers. Here we have the main homepage and toolbar. I cropped out the updates from my friends (which would normally have shown below). And here we have my bookshelves. This is just like adding a label to the book. I'm not super consistent with remembering to label everything. Can't get too bogged down in small things. And yes. That "to read" is a ridiculously high number that I will never finish because every time I finish a book I add three more. These are the books that I've recently finished. Well. Except for Pandemonium which I just finished. SO GOOD. Huge cliffhanger ending. Be prepared. :/ (And my apologies if that was a spoiler to anyone ... they don't bother me so I am always unsure of how far to go in any reviews I might write). Speaking of reviews! That is one area I want to improve on. I have a book blog now. 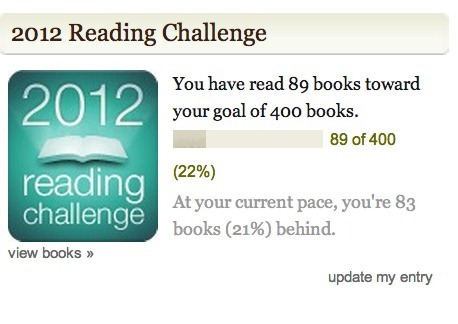 I didn't when I first started on Goodreads. I feel like book reviewing is ... well. I don't think I need to totally summarize the plot. That is for the book blurb from the publisher. I just write about my gut reactions and any ideas for use in the library classroom (if it was a book that I might use ... I do read other things!). So I guess readers sort of have to trust my judgement if they read my reviews. Maybe not the most helpful way to go about it but if it is going to take me as long to write the review as it did to read the book, well ... I'd rather be reading new books. Y'all don't need that much of my opinions! But I post the same thing in terms of book reviews to both places. In fact I embed my Goodreads reviews in my blog cause they make it look all nice and pretty with the book cover image. You can sort your books ... see the little carat right there next to the left of "cover"? Click on it and it will show you the first books you added to that list (in my case from 1-1055 instead of from 1055-1). Mine start back in 2008. I don't delete some of them cause I still want to read them. Eventually. Yes, I have gone back later and deleted books that no longer seemed as interesting. even though right now I am behind. Summer will help me catch up! I have my account set to send me daily book related quotes. I like them but you don't have to get them. Then they send me ... oh, about every 30 hours or so an update with all of the books that my Goodreads friends have added. You'd be amazed at how much fun that is for a book nerd ... I find out about cool titles and we can comment back and forth on our thoughts about respective books. In terms of the classroom you could create a generic class account (for example, MsOsclass13, password) and write collaborative reviews for the books done as read alouds or in small groups. You can also search and read reviews maybe to help students decide what they wanted to read next? If your students are old enough to have their own email accounts you could help them set those up. I'd get parent permission and check with your district first about policies. I am of the mind that most of us are very responsible so please, meet the kids or parents whereever they might be. Connect on Goodreads if it will encourage reading! But I know some people abuse anything even slightly social media related in terms of the classroom and the rest of us pay for it. So please be smart. 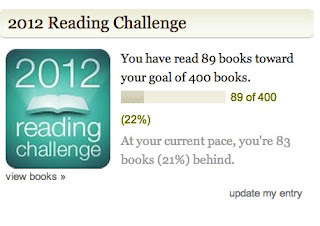 Confession-- I started posting regularly on Goodreads so that I could have the progress widget! It IS great to show to students. Hey, now that you have a blog, are you going to do MotherReader's 48 Hour Reading Challenge? Such a great geektastic party, and a great way to find new blogs as well as new readers. Angie, how do you use this with your students? I would love to fun a safe, online alternative to the paper reading log! And for now? Just show them my reading goal and how I track all of the books that I read. I tried doing the paper and pencil (or poster size version in the library like ... drat, I can't remember his name ... that speaker that came? And had the book?) and it just didn't do it for me. Can't do everyday logging but can definitely do when I finish a book (in the summer those are the same things ... HOORAY!). Haven't tried like writing collaborative reviews and posting after we read a book together. Might create another account for that. Great post! I might just do a post with a link back to yours if that is ok!